Hawaiʻi’s native species and natural communities do not recognize property lines, and for the State to comprehensively protect them, a program was needed to encourage the management of private lands that contain some of Hawaii’s most intact ecosystems and endangered species. The Natural Area Partnership Program was established by the Legislature in 1991 to provide state funds on a two-for-one basis with private funds for the management of private lands that are dedicated to conservation. 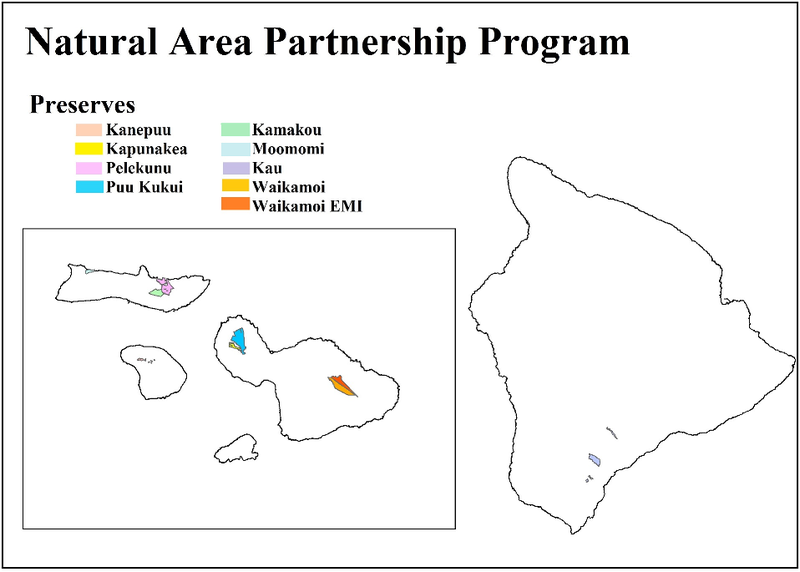 With over 30,000 acres enrolled, this innovative program complements the protection efforts on state lands – a partnership essential for the success of conservation in Hawaiʻi. What Type of Lands Does the NAPP Protect? Lands and waters that might qualify include areas with intact native Hawaiian ecosystems, essential habitat for endangered species, and areas within the protective (P) subzone of the Conservation District. This program can support a full range of management activities to protect, restore or enhance significant native resources or geological features. The program can help provide funding for the development of long-range management plans. Because protecting endangered species does little good if we do not protect the natural communities they need to survive, DLNR looks to protect intact native ecosystems with many rare species. The NAPP requires that the land be protected from development by a conservation easement. Please see the section “Get Involved” for more information about the easement requirement. Hawaiʻi is experiencing an extinction crisis -beginning around 1,500 years ago, the islands have been losing species at a rate thousands of times faster than the rate over the previous 70 million year history of the Islands. Although Hawaiʻi has more endemic species (species found no where else in the world) than any area of comparable size on Earth, the threats facing these species are numerous, immediate, and complex. For example, Hawaiʻi used to sustain at least 140 species of native birds -now 70 of these species are extinct, and of the 70 remaining, 30 are endangered. Besides the outright loss of forests, birds are going extinct due to disease and predation by alien species. While we do not know what all of the threats are to these species, we do know some basic management techniques which give our species a much better chance of survival, by protecting the natural communities that they live in. While we do not understand all the threats that face our species, we face an even more complex problem caused by humans: birds, our other endangered animals and plants, and the natural communities they comprise, do not recognize property lines. These species and natural communities need protection wherever they are. The NAPP was created to address this issue. Cooperation between the state and private landowners is needed for protection efforts to be successful. To view the NAPP brochure, click here.